A little right of centre in the middle of England lies Lincoln, home to 94,600 souls, a 700 year old cathedral and a 135 year old football club. 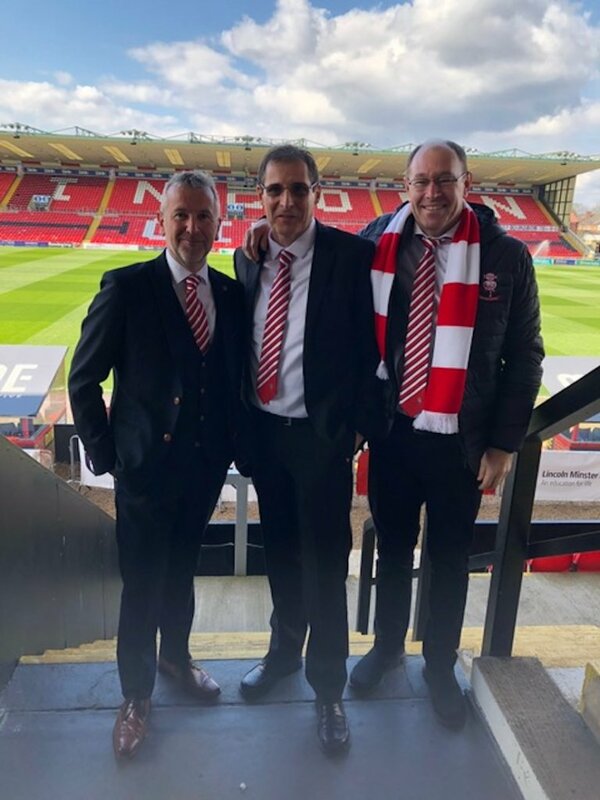 Its team, Lincoln City, gets its nickname from The Imp, a famous gargoyle in the cathedral which overlooks the club’s Sincil Bank stadium where, since 1895, it has given the locals lots to talk about. Another historic connection is to the World War Two “Dambusters” – the Royal Air Force’s famous 617 Squadron which was based at Scampton just six miles away. 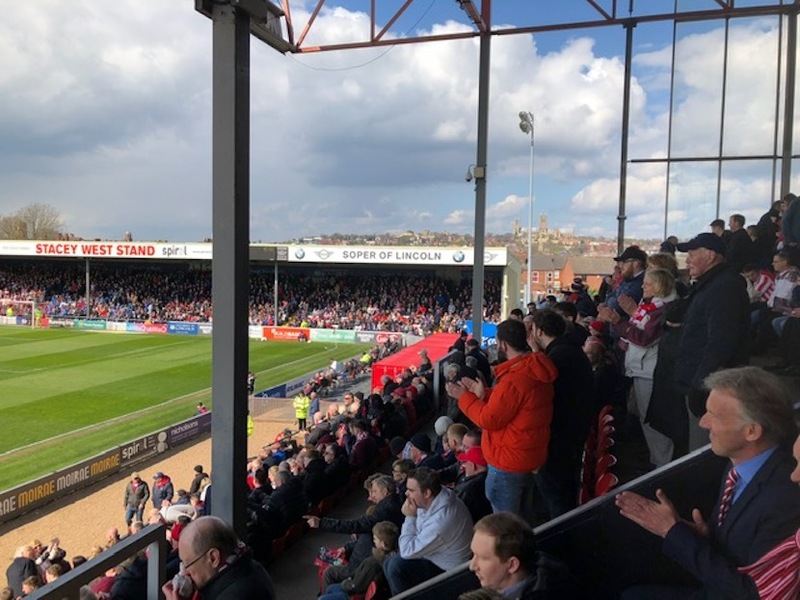 A slice of a Sincil Bank grandstand is even called 617 Squadron – and it’s where the staunchest of Lincoln City’s supporters gather to watch their beloved “red and white army”. History oozes around this place. And on Saturday, I made the three hour drive from London to witness another chapter being written. The nervous Imps, despite the loud urgings of their managers, brothers Danny and Nicky Cowley, only managed to draw with Cheltenham Town. 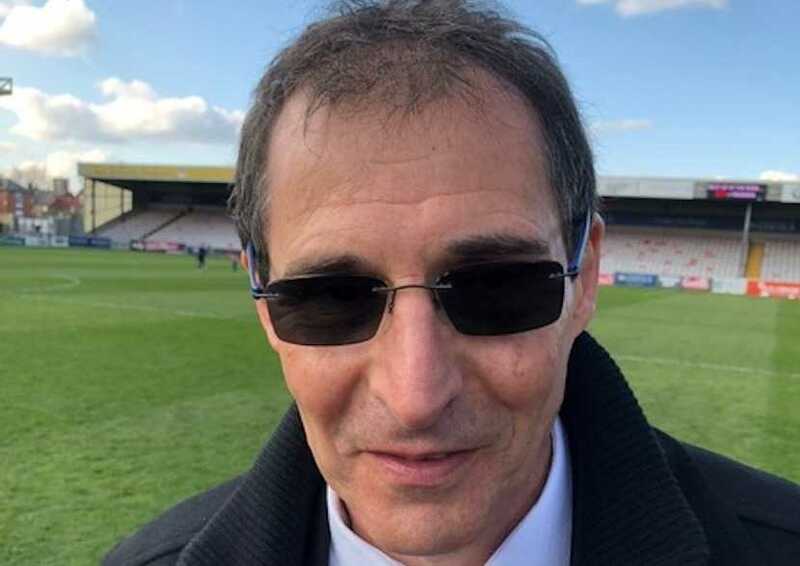 But other results went their way and with four more games left, they secured their second promotion in three years, upgrading into a league where Lincoln City last competed more than three decades back. Before we get into the story of English soccer’s latest fairytale – one with a strong South African connection, some more background. In 1987, when it finished bottom of the old division four, Lincoln City became the very first club to be automatically relegated out of England’s professional Football League. After bouncing back the very next season, in 2011 The Imps were relegated once more. This time the demotion looked to be permanent, and after half a dozen long seasons in the bottom half of this tier, there seemed little hope of a rebound. And long suffering funders started muttering about the hundreds of thousands of pounds in debt owed. Enter Clive Nates, a recently retired hedge fund manager from Johannesburg with an obsession for football. Clive, who is now the club’s chairman, got some Saffer pals involved. Between them they cleared the debts and provided the cash to recruit the inspirational Cowleys. The result has been beyond the wildest dreams of everyone associated with the club. But I’m getting ahead of myself… Ahead of the kickoff I sat down with Nates and fellow Joburg-based director Lincoln City Ashley Mendelowitz into a quietish room. And started by asking Clive about the town…. CLIVE NATES: Oh Lincoln. It’s a city I hadn’t even visited before I got interested in Lincoln City and thought of the idea in investing in the club. I only got over for the first time to see the city and the club in March 2015 and really surprised at choosing a club in such a beautiful city. The population is right about 90,000 but then, there’s no real major cities for quite some distance. So, it does mean that the people who live in Lincoln and around Lincoln… if they’re interested in football then they’re likely to be Lincoln City fans. 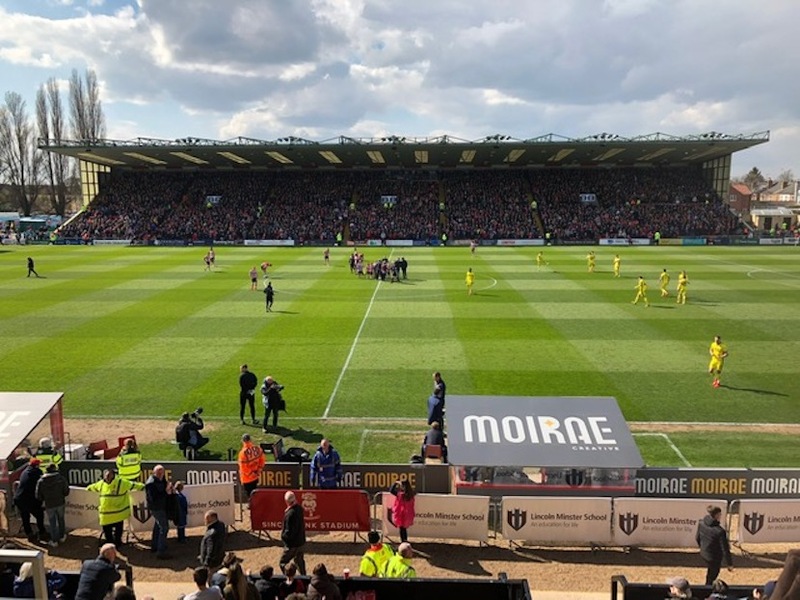 Lincoln City’s faithful have been packing out the 10 000 seater stadium this season – with house full signs again on Saturday, and for all of the games still remaining in another triumphant season – played 42; won 23; drawn 15; lost only 4. It’s got a football club that’s been around for more than 100 years…..
Now, it’s a sizable stadium. How many people do you pack into this ground every week? Well the capacity is around about 10,000 and our average in the league this season is just under 9,000. We’re looking at sell outs for this game and the last two games of the season and that will probably push us just above 9,000 average for the season. With promotion at stake the scale of the occasion appeared to get to The Imps, with the game against visiting Cheltenham Town ending in a 1-1 draw. Enough, though, for Lincoln City to become the first team this season in the four English leagues to secure promotion. Lincoln City; people who followed English football over many years will have heard of it, at least. How did you get involved? Since a kid obviously being interested in football, I chose an English football team to support and the team I chose to support was Everton. My hero as a kid was Alan Ball who was the youngest member of England’s 1966 World Cup winning team. Everton’s a long jump to Lincoln City. Okay so in 2002 Everton formed an alliance with Lincoln City and as a result of that alliance I started to follow a couple of other clubs for various obscure reasons that I followed other than Everton, even though Everton was obviously the team that I followed the most. And for whatever reasons, Lincoln City was the team that stuck with me even though not much came out of the alliance between Everton and Lincoln City. That’s again a big jump from following a club to being the chairman. Well I retired from hedge fund management in 2011. I spent three years trading offshore equity markets and after three years of doing that I thought it was time to either go back into hedge fund management or tick off the number one item on my bucket list, which was getting involved with an English football club. Now you tapped your old pals from Peregrine. Right next to you is Ashley Mendelowitz who is a data specialist and a tech specialist and I’m sure he’s had some input into Lincoln City. Of course, Sean Melnick was the founder of Peregrine – a very successful company in South Africa which perhaps is not that well-known here in the UK. And then I see you’ve also got Greg Levine involved who’s another well-known businessman from South Africa. So, how does that South African or the ‘Saffer’ connection come into Middle England? Well I got hold of the club in early 2015. They put out an announcement that their bankers were looking at withdrawing their overdraft and loan facilities. I’d only planned to get in touch with them and come and visit Lincoln for the first time in May of that year. But I thought I’d better get in touch sooner because of the potential problems that they had. There certainly were some issues that they would have had to look at sorting out to try and fill the gap of the £380,000 new loans that they had to the bank at that point. But Clive, at this stage, although it’s a proud history, the club had really fallen on hard times. They weren’t even playing in the football league anymore. Yes, they got relegated four years before that. And yes, they finished in the bottom half of the table every season in National League. Times were a bit tough without a doubt, for the club. When you say ‘a bucket list’ did you always want to have some kind of a relationship with an English football club on an ownership level? Well I never thought of it until probably sometime in 2014 that ownership was actually a way to get involved. I’d always wanted somehow to have a connection in football. Now those first thoughts came the second half of 2014. Got in touch with the club in early 2015 and had arranged to visit the city and the club for the first time in March 2015. About a month before I came over. I had a chance meeting with Ashley. I told him about this ridiculous venture that I was potentially looking at and Ashley is also a football fan. He knew a Capetonian whom he had played football with when he was a lot younger who had got involved in Swansea City when they were a 4th Tier club. And was with them right up to the Premiership and Ashley said to me ‘well. if I actually go ahead and get involved, he’d like to join in as well’. Ashley, who was that Capetonian? ASHLEY MENDELOWITZ: It was a guy called Brian Katzen, a South African Capetonian. We played soccer in Cape Town for a few years together and one day I opened a newspaper and saw that he was involved at Swansea and started following that story. They had a hell of a journey. I’m not sure that he got involved for returns. I think it was also a passion investment but it worked out incredibly well for him. And when Clive spoke to me about Lincoln, one of the things that I thought would actually be great is to be able to meet with Brian and hear the learnings here – their journey – and we ended up doing that a little bit later on in the year. Is he still involved with Swansea? He sold his consortium, exited actually at a very good time. So, they got a really good return over 10 plus years but that afternoon we spent in Cape Town with him was really valuable. You know he gave us some really good insights on what to do, what not to do, and if anything, it kind of increased our excitement about getting involved. Clive, was there any thought of asking Brian to come and perhaps join your journey or were you two small… or was Lincoln too small for your at that stage? CLIVE NATES: I would never have gone in and said straight off ‘come and join us in this; but I think there was a feeling that he had had enough of football. Although it was an incredible run that he had with Swansea City… He ended up making quite a bit of money out of it. The exit from Swansea City wasn’t that happy and some of the fans turned against the consortium so I think he had had enough of football in any event. Even though it had been a long run… Is that something that worries you, that you’ve had an incredible run already (and we’ll get into that in a minute) but the fans are fickle? Yes, I suppose they can be. I think we all are. It’s a way of life. You can’t really worry about that. I mean you’ve got to obviously plan for the future, and continue to do your best but if something happens that things turn down a bit, so be it. It’s not going to stop me enjoying the ride and doing the best I can at this point. Tell us about this ride. Well, it’s been an extraordinary ride. The turning point was our ability to get Danny and Nicky Cowley to join us. There is no other management team that could have done what they have done for the club. So where did you find Danny and Nicky? Previous manager Chris Moyses decided to step down from the job and left in May 2016. 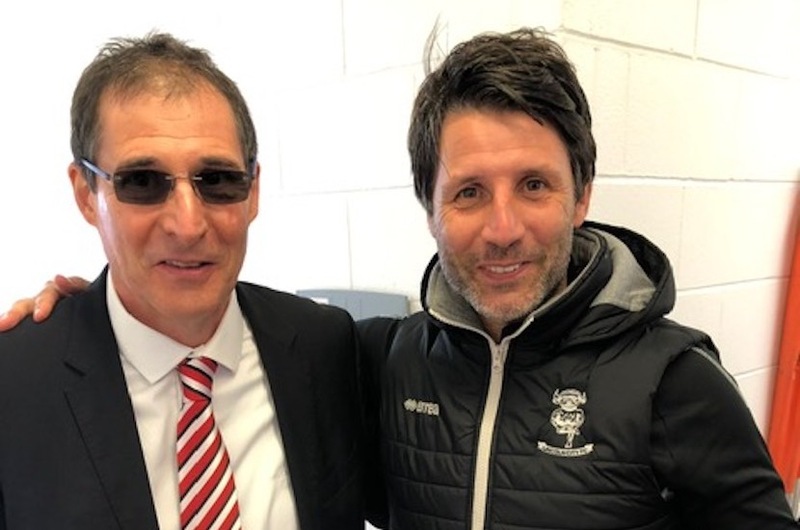 Clive Bates and the man today rated one of the hottest managers in English football, Lincoln City’s Danny Cowley (40) whose record with the club since taking over in May 2016 has been beyond everyone’s wildest dreams. That’s right. I became a director in February 2016. So, he decided to step down in April. That was announced a couple of games before the end of the season. So, we started the process of looking for a new manager. And funnily enough had noticed probably about six months before an article about Southampton and the way that they went about scouting for a new manager before they actually needed a new manager so that they would be already out there looking for the right person for that club. And I thought oh what a brilliant idea. And I just started to have a look around at managers in that division and below and see which managers potentially, would be a good idea for this club and the only ones that actually stuck out were Danny and Nicky Cowley. They had done credibly with a smaller club in Essex – Concord Rangers. Three promotions with them. A couple of cups that they won and had done very well with Braintree Town which was a part time club in the National League (one of the lowest budgets in the league) and they’ve got that team up into third place and actually got into the playoffs of the National League, while we were a team… a much bigger team, potentially and we finished in the bottom half of the table. Just from all the articles that I read about them you know how meticulous they were, how hardworking they were, but it didn’t look like it was actually feasible at all. They were only part time in football management. They had full time jobs in teaching. I lived in Essex which is two hours away from Lincoln. So, I just tossed that idea away. But Danny applied for the job. I still remember the night when I was told by the then chairman that you know Danny had expressed an interest and they were clearly the best candidates for the job. Just everything about them. They have the ambition, just how hard working they are, and the planning that goes into everything. Have you sat in on team meetings? That famous Monday post-mortem. Win or lose. I think I read somewhere if you won 5-0 or lost 5-0, it was still the same thing. You sit down and meticulously go through the game. Yes. That’s what they do with the team and also the planning, the video analysis that goes in ahead of the game, and yes; it’s incredible to sit there and watch just how in-depth they go into the analysis of what has happened previously and the information that they give to the team ahead of a game. So, what’s happened since to the team’s performance since you got involved? Well we finished the end of that first season in 13th place in the National League. Danny and Nicky then came in for the 2016/17 season where we won the National League. Did they have any new players – any extra ammo to use? Yes, they did bring a couple of players. A few came in from their previous team Braintree Town so there were players that they already knew. Yes, there were changes to the team and they brought in some very good players and yeah, we won the league title with 99 points. But maybe the most exciting part of that season, was the incredible FA Cup run that we had. 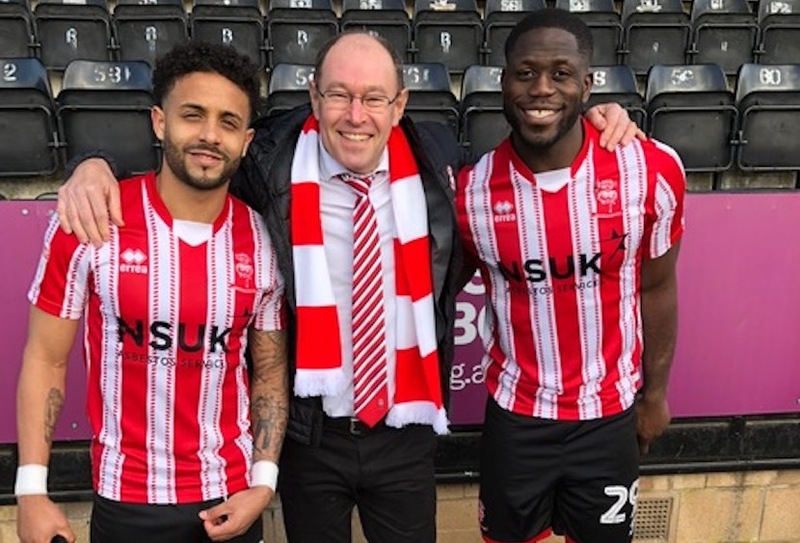 Lincoln City investor and director Ashley Mendelowitz with the team’s top two goal scorers this season, Portuguese winger Bruno Andrade (left – 10 goals), and English striker John Akinde (15 goals), who at £250 000 is the club’s record priced signing. Best in 103 years for a non-League side. That’s right. If you go back all those years, the non-League then was nothing like the Non-League it is now. I think there were only two divisions at that point so you could be essentially in the third tier of English football and you were a Non-League team. Here, we were in the fifth tier of English football, knocked out League 1 Oldham Athletic and in the third round we then knocked out championship side Ipswich Town followed by Brighton and Hove Albion who were top of the championship. And then we beat Premier League team Burnley with a late goal to win that game 1-0 and got through to the quarterfinals and went to the Emirates in front of 60,000 people and played Arsenal. And that put Lincoln City on the map for people all over the world because suddenly you had this non-League side with a brand new manager – new ownership structures. Tell us about the economics. You arrive here. They were talking to their bankers. Did you have to put a lot of money on the table to get in to get a board seat? Well when I first sent the e-mail off to the then chairman Bob Dorian, I indicated that I was prepared to put in a certain amount every year over a five-year period. I didn’t want to put everything in at once. I sort of put it on black or red and comes off or it doesn’t come off. And it was also you know to take it slowly – see if I liked this idea of getting involved with a club whether I could get on with the people that were involved with the club. It was always going to be a staged investment into the club. And obviously with Ashley and Sean Melnick joining in as well there was a bit more money than I’d originally targeted and yes essentially, that first investment early in 2016 went to pay off the losses that were made in that season. An agreement was eventually reached with the bankers so that we didn’t have to repay that full amount at that point, and we would look to repay that over a period of time. As it turned out that with the FA cup run and the amount of money that we made from the FA cup run. we no longer had any loans with the bank so that relationship has now ended. You say money made from the FA cup. How does that work? Well through the attendances in the competition both home and away the clubs share the attendance money from those matches. There was also prize money from the Burnley game. We got almost £250,000 from that alone. And then really the big kicker was going to the Emirates and sharing in the gate for 60,000 people and you know that helped us have cash in the bank and it helped us fund a new training ground that we have built. And for the first time in the current season the team is using a new training ground. Surely then, Danny and Nicky Cowley would be hot property elsewhere. I’m just trying to look at it from a from an investor’s point of view. Here come these new guys. They’ve rejuvenated the team. They’ve made a fantastic return on investment in year one. Has it been difficult to retain their services? Well, since we first brought them in, in 2016, we have twice renewed their contracts so they now have a contract until June 2022. There’s no doubt that there have been approaches for them. And hopefully today you know there’s the potential to secure the third title in three seasons so that obviously does make them hot property. But we’ve done our best to keep them. We’ve done our best to meet their ambitions as well as our own ambitions. And you know, I think a big change as well was their decision to bring their families up to Lincoln. So, at the start of the season their families moved up from Essex. Their kids are in a local school – a fantastic school that they’re at and we’re doing the best we can to keep them. We know at some point a bigger club will probably get them to move on to achieve their long-term ambitions. I spoke to the chairman of Bournemouth a couple of years ago and that was the big question, Eddie – how their manager who helped them to transform that club has stuck with them even though they’re now a Premier League team and middle of the table. Have you learned anything from the way they’ve approached that which is a significant challenge? Yes, I’ve had a chance to speak to Jeff Mostyn. He’s very friendly with Greg Levine who connected us. It’s interesting though that Eddie Howe did leave Bournemouth for a period when they were in league one. He went off to manage Burnley for a while. It actually didn’t turn out very well and he came back to Bournemouth. I think the parallel, you’ve got to be careful about the parallels you can draw between Lincoln City and Bournemouth, for sure. Eddie Howe has done fantastically and he did very well to get them there initially. From League 2 to League 1 but in League 1, they actually managed to find a Russian billionaire to invest in the club. We haven’t done that yet or even found a South African yet to do that. And unfortunately, none of us worked hard enough to become billionaires. Yeah but you got a South African connection and you got a whole nation. If they know that this is a bunch of Johannesburg guys who’ve actually gotten involved in Lincoln City, perhaps you you’ll have a whole nation supporting you. Is there any way you can leverage that? Well I haven’t thought about in particular leveraging that but obviously there’s a lot of people now in South Africa that have heard about the club, friends and relatives and colleagues. So yeah, I think we’ve got a you know growing South African base of football fans that are supporting or at least keeping an eye on Lincoln City. And yes, through connections of Ashley and Sean, we’ve actually brought in some additional investors into the club. You mentioned earlier ambition. What is the ambition? At this stage, it’s very much just to keep doing the best we can. You know season by season seeing how we can keep improving the club and that I think is something that we’ve done over the last three years. And if all goes well today, we’ll be on our way to League 1 next season and that again is a new challenge. Obviously, you’ve got some very big teams in that league currently this season. You’ve got teams like Sunderland and Portsmouth and Charlton Athletic, teams that people can remember. We’re in the top flight of English football so it is going to be more difficult and maybe similar to what we did when we came out from National League to League 2. We’ll be looking to try and finish in the top half of the table and maybe give ourselves an outside chance of reaching the playoffs. But again, we’ve got to keep our feet on the ground. Success doesn’t come in a straight line although the way Danny and Nicky have achieved things in the last three years it looks very much like that. But I’ve got to remain grounded and do our best to try to find the finances to provide Danny and Nicky with a competitive budget next season. How did you become chairman at the end of last season that then chairman Bob Dorian decided to stand down? The rest of the board decided that I should have the short straw and become the chairman. And was that also on the bucket list. No it definitely wasn’t. In fact, when I first decided to get involved in the club, I didn’t have any aspirations to get involved in the management of the club. I just wanted to have a connection. I just loved football and I just wanted to be close to a team. And it was the directors, the chairman at the time that got me more involved in the club and the way I am. You read that, you know you’re out, so if you’re going to get involved, I’ll put everything into it now. 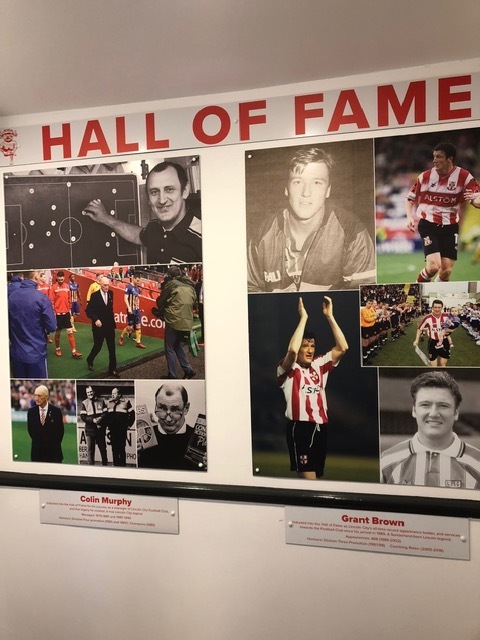 On Saturday, the now 49 year old Grant Brown became the second person to be inducted into Lincoln City’s Hall of Fame. The defender made a record 491 appearances for the club between 1989 and 2002. What is that? What is it when you say everything. Define it. Well in a way it’s become a full-time job. Even though I only spend up to three months a year in the UK with communication as it is today. We communicate through Skype, through WhatsApp telephone calls. There’s just constant communication at the moment between, in particular our CEO and the other directors that are part of our executive committee. And yeah it takes up a lot of time. We’re talking to a number of potential investors at the moment. There certainly is interest, the ability to attract further investment will determine how far we can take the club. How did they see your contribution here? Well I suppose to some extent it’s been on the financial side looking at the numbers. It’s being part of that executive committee which meets on a monthly basis that is continually in contact you know supporting the CEO. If there’s any decision that needs to be made that he believes needs to be referred to, it’s discussing that, coming to a conclusion as to what we should do. And there are just so many moving parts to a football club. The times when I thought hedge fund management was difficult. This seems to take a turn at the level and the community here in Lincoln has been brilliant. The welcome that I’ve had, the hospitality and obviously you know with how we have done over the last three years the fans in general are very grateful for what the club has achieved following a winning team. What was it like three years ago when you came to the stadium? Well it was a lot quieter than the first game I attended. There were probably around about 2,000 in attendance that day. We actually lost two nil at home to a team that was in the relegation area so it wasn’t a great start. But then again, I didn’t come with any expectations, just to be involved. Our times you have them whether it’s in hedge fund management or any part of life so you just come through it and you enjoy the good days that we now have.